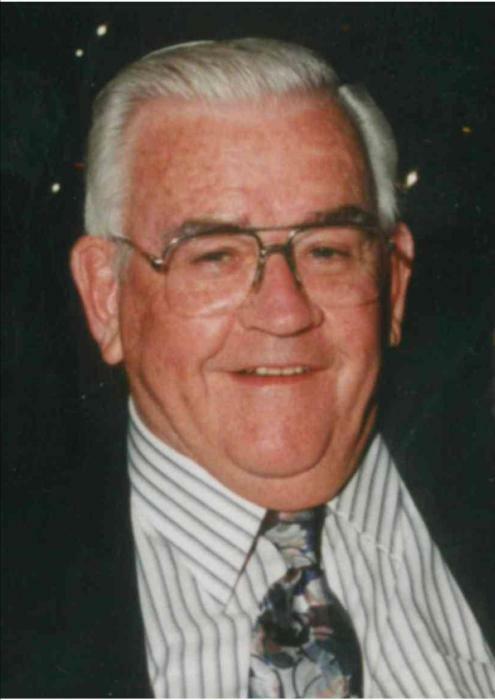 JERSEYVILLE - John Edwards Bray, 89, died Tuesday, January 22, 2019 at St. Luke's Hospital in Des Peres, MO. He was born on November 16, 1929 in Jerseyville, one of ten children born to the late John Thomas and Edna Mary (Edwards) Bray. John was a lifelong Jerseyville resident and graduated with the class of 1947 from Jersey Community High School. Shortly after graduation, he enlisted with the United States Air Force, where he served our country honorably for five years. He married the former Theresa M. Hetizig on April 23, 1955 at St. Mary's Catholic Church in Fieldon and although their time together was far too brief, their 28 years of marriage was blessed with three children before her death on October 24, 1983. John was blessed once again when he met and married the former Frances (Lambos) Green. John and Frances wed on February 6, 1986 at the Holy Ghost Catholic Church in Jerseyville, at which time he gained two more daughters and the blessings of the grandchildren that followed and filled he and Frances's life with so much joy and laughter throughout the years. As a young man, John worked a variety of jobs, doing whatever was necessary to support his family. At the age of 28, he enrolled at St. Louis College of Pharmacy, fulfilling a childhood dream of his to become a Pharmacist. He purchased the former Reeses Drug Store and began his long and proud career as owner of Bray Drug Store, where he gained much respect and many friendships throughout the community before his retirement in 1996 after over 30 years in business. After his retirement, John enjoyed traveling with his family, most particularly He and Frances' annual trips to Florida for the St. Louis Cardinals Spring Training sessions and always enjoyed a good game of golf. He was a skilled carpenter and was always willing to lend a helping hand with any project that was thrown his way. His outgoing personality made him a natural fit at any social gathering, and he particularly enjoyed attending his High School class reunions as well as the monthly Birthday Club gatherings. John was a man of true loyalty. Loyalty to his faith, as a devoted member of Holy Ghost Catholic Church and a 4th Degree Member of the Knights of Columbus; to his country, a 65 year member of the Jerseyville American Legion Post 492; to his community, as an honest and hard working friend and business; and most notably, his loyalty to his family. There was no greater joy than the time he was able to share with each and every one of them and they all knew that no matter how big or small, they could count on him in any and every way. Surviving are his wife of 32 years, Frances Bray of Jerseyville; his daughters and their spouses, Nancy and Don Elliott; Renee Bray; Johngy and Jeff Loellke; Robin Rowling and Linda and Chuck Gast, all of Jerseyville; twelve grandchildren and their spouses, Julie and Seth Alexander of Jerseyville; Mary and Garrett Ingram of Mt. Sterling; Laura and Craig Fallin of Jerseyville; Torrie and Gary Vanausdoll of Dow; Catlin Utterback of Springfield; Joey Utterback, and his fiance Taylor, of Celebration, FL; Theresa Loellke of Jerseyville; Amanda Loellke of St. Louis, MO; Lindsey Gast of St. John's, FL; Chris and Sarah Gast of Stuart, FL; Ross Rowling of Terre Haute, IN; and Mary and Jake Brown of Wood River; 17 great-grandchildren; his siblings, Robert "Bob" Bray, and his wife Joy; Jim Bray; and Margie McIntyre, all of Jerseyville; a sister in-law, Ann Bray of Jerseyville; along with numerous nieces and nephews. In addition to his parents and his first wife, he was preceded in death by a grandson, JR Crotchett; as well as six sisters, Edna Mary Cook, Lois Bray, Helen Seago, Katie Bleicher, Doris Shaw and Jeanne Miller. Visitation will be from 11 a.m. until time of funeral mass at 1 p.m., Friday, January 25, 2019 at the Holy Ghost Catholic Church in Jerseyville with Father Marty Smith officiating. Burial will take place at the St. Francis Xavier Cemetery in Jerseyville. In lieu of flowers or plants, memorials may be given to St. Francis/Holy Ghost Catholic Schools or to St. Jude's Children's Research Hospital.